Will NYC Win Be “Taken” from PETA? The radical animal liberation group People for the Ethical Treatment of Animals (PETA) claims horse-drawn carriage rides are an “outdated practice” that cause “cruelty” to horses, and it is active in an initiative to ban horse carriages in New York City. Those complaints are rich coming from a group that slaughtered 82% of the cats and dogs in its care last year, and PETA’s initiative has already been met with public scorn: 64 percent of New Yorkers oppose a ban. And now PETA’s unpopular campaign is taking flak from a high-profile opponent: actor Liam Neeson. As a result, an entire way of life and a historic industry are under threat. Kanye West called PETA “just plain idiots” after the group criticized him for wearing a fur coat. The rapper even waxed lyrical against PETA in one of his songs. Khloe Kardashian, who used to support PETA, called the organization “lying bullies” after an activist with close ties to PETA flour-bombed her sister, Kim. In an interview with Howard Stern, pop star Lady Gaga offered Stern, a major supporter of his local pet shelter, support for the animal charity of his choice. Her only condition: it couldn’t be PETA, because PETA kills animals. Neeson’s stance against PETA’s campaign to ban horse-drawn carriages in New York City is just the latest example of celebrities crying foul over PETA’s fringe views. Even the Times, which regularly cozies up to PETA’s pals at the Humane Society of the United States, is against the carriage horse ban. As more people become aware of PETA’s radical agenda, more celebrities will continue to stand openly against it. 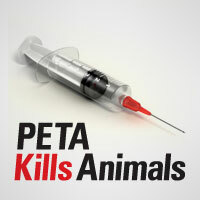 Indeed, it seems the more PETA talks, the more credibility PETA loses.